In the previous article,\\\\\\\\\\\\\\\\xc2\\\\\\\\\\\\\\\\xa0Scottish Independence, we highlighted Scotland\\\\\\\\\\\\\\\\xe2\\\\\\\\\\\\\\\\x80\\\\\\\\\\\\\\\\x99s referendum for independence and a few notes about what it may mean.On Thursday the 18th of September, 2014, the Scottish people voted\\\\\\\\\\\\\\\\xc2\\\\\\\\\\\\\\\\xa0No to independence, choosing to remain within the union of the United Kingdom. According to\\\\\\\\\\\\\\\\xc2\\\\\\\\\\\\\\\\xa0gov.uk the majority vote won with a count of 55.3% to 44.7%.A significant factor about the voting turnout was the sheer number of people who did vote, 84.5% of the eligible voters. With the current dissolution with politics within the United Kingdom and globally, this was an astounding turnout.Another point to note would be the ratios of the voters: as can be seen via the research thanks to the\\\\\\\\\\\\\\\\xc2\\\\\\\\\\\\\\\\xa0Mirror, the majority of Yes voters were\\\\\\\\\\\\\\\\xc2\\\\\\\\\\\\\\\\xa0younger people, from poorer areas.We are highlighting this to show the interest in a decentralised political environment. Another 5 to 10 years and these factors and numbers may be even more pronounced if the current state of affairs (loss of jobs, cost of living rising) continues. Following the calls for independence in Scotland, even though it failed, the Northern Cities and the rest of Britain have watched with great interest. At the end of August the five northern cities, Leeds, Liverpool, Manchester, Newcastle upon Tyne and Sheffield publish\\\\\\\\\\\\\\\\xc2\\\\\\\\\\\\\\\\xa0One North, a report calling for investment into their transport infrastructure, to create jobs, inspire growth and help rebuild their economies. The economy of Greater Manchester is larger than that of Wales,\\\\\\\\\\\\\\\\xe2\\\\\\\\\\\\\\\\x80\\\\\\\\\\\\\\\\x9d says Leese. "The idea that we should have any less control over our own affairs is just not sustainable any more. ~\\\\\\\\\\\\\\\\xc2\\\\\\\\\\\\\\\\xa0The Guardian. The southwest of England has also been watching with keen interest; talk to anyone here (disclaimer: I am from the Southwest) and it is the rare person who thinks our UK politicians should continue to have as much power as they have and take as much as they do (disclaimer: I have not met one person in this locality who thinks like this; those that edge more along these lines of thoughts are the elderly who often intersperse their comments with mention that they do not want anything to change).Unfortunately for those who wish for nothing to ever change, and for us to remain forever in the 1980\\\\\\\\\\\\\\\\xe2\\\\\\\\\\\\\\\\x80\\\\\\\\\\\\\\\\x99s (as sometimes it feels), change is inevitable - sometimes slower than it should be through enforced ignorance (dark ages), though eventually a\\\\\\\\\\\\\\\\xc2\\\\\\\\\\\\\\\\xa0revolutionary will always inspire climatic changes.And following the Scottish referendum\\\\\\\\\\\\\\\\xc2\\\\\\\\\\\\\\\\xa0Wales has called for more powers to self govern, to finance their own matters more, improve jobs, and restore their own economy. Can it be said that even though the Scots failed, their attempt has shown a crack in the United Kingdom\\\\\\\\\\\\\\\\xe2\\\\\\\\\\\\\\\\x80\\\\\\\\\\\\\\\\x99s united front, and that in fact various powers around this nation are seeing a light at the end of the tunnel? Wales needs its own say on taxation, policing, rail franchising, large energy projects and much more. Any further dithering on these powers will cost Wales dearly. ~\\\\\\\\\\\\\\\\xc2\\\\\\\\\\\\\\\\xa0The Daily Post. It does cross my thoughts whether Wales and the Northern Cities would also be threatened with the taking away of the pound and the various other threats of financial stability that plagued the Yes camp from the Better Together campaign.And should we dare to even bring up Northern Ireland which has had the IRA fighting against English dominance for as long as I can remember, though sadly, in a much more\\\\\\\\\\\\\\\\xc2\\\\\\\\\\\\\\\\xa0violent fashion than the recent Scottish referendum.The\\\\\\\\\\\\\\\\xc2\\\\\\\\\\\\\\\\xa0interest in\\\\\\\\\\\\\\\\xc2\\\\\\\\\\\\\\\\xa0devolution from the\\\\\\\\\\\\\\\\xc2\\\\\\\\\\\\\\\\xa0Northern Ireland Assembly will surely soon be heard by those in Westminster. And it is doubtful that Northern Ireland would be fazed by the financial threats and arguments from a Better Together campaign as Ireland\\\\\\\\\\\\\\\\xc2\\\\\\\\\\\\\\\\xa0already uses the Euro (and previously used the\\\\\\\\\\\\\\\\xc2\\\\\\\\\\\\\\\\xa0Irish Pound). Ed Miliband (leader of Labour, the UK version of the US Democrats) has already promised the minimum wage in the UK to\\\\\\\\\\\\\\\\xc2\\\\\\\\\\\\\\\\xa0rise to \\\\\\\\\\\\\\\\xc2\\\\\\\\\\\\\\\\xa38 in 2020 (it is\\\\\\\\\\\\\\\\xc2\\\\\\\\\\\\\\\\xa0currently \\\\\\\\\\\\\\\\xc2\\\\\\\\\\\\\\\\xa36.31). Though of course this would mean that public would have to vote Labour into power in the next general election (2015) and the 2019 general election.And with 6 years away and the rate of inflation (thank you\\\\\\\\\\\\\\\\xc2\\\\\\\\\\\\\\\\xa0QE), it is debatable whether \\\\\\\\\\\\\\\\xc2\\\\\\\\\\\\\\\\xa38 in 2020 will buy you even less for your money than \\\\\\\\\\\\\\\\xc2\\\\\\\\\\\\\\\\xa36.31 today.Whilst David Cameron already is in disputes about promises of continued funding to Scotland and greater powers, his own Tory MP\\\\\\\\\\\\\\\\xe2\\\\\\\\\\\\\\\\x80\\\\\\\\\\\\\\\\x99s already declaring that\\\\\\\\\\\\\\\\xc2\\\\\\\\\\\\\\\\xa0they would oppose any such moves. The pledge has met with a furious response from Tory MPs including the rail minister, Claire Perry, who said Scotland should not be given "financial party bags" paid for by English taxpayers. ~\\\\\\\\\\\\\\\\xc2\\\\\\\\\\\\\\\\xa0The Telegraph. And that straight after the No vote, Cameron has been stating that Scottish MP\\\\\\\\\\\\\\\\xe2\\\\\\\\\\\\\\\\x80\\\\\\\\\\\\\\\\x99s would have no say in English matters, thereby conveniently\\\\\\\\\\\\\\\\xc2\\\\\\\\\\\\\\\\xa0eliminating 40 Labour MP\\\\\\\\\\\\\\\\xe2\\\\\\\\\\\\\\\\x80\\\\\\\\\\\\\\\\x99s from opposing the Conservatives, and thereby eliminating the Labour majority over the Conservatives (Conservatives carry a combined majority with the\\\\\\\\\\\\\\\\xc2\\\\\\\\\\\\\\\\xa0Liberal Democrats, but a pure Conservative vote can be opposed by the majority of Labour MP\\\\\\\\\\\\\\\\xe2\\\\\\\\\\\\\\\\x80\\\\\\\\\\\\\\\\x99s). In 2010 the Liberal Democrats Leader (Nick Clegg), with Decentralisation Minister Greg Clark, set out plans for a\\\\\\\\\\\\\\\\xc2\\\\\\\\\\\\\\\\xa0decentralised Britain.One of the potential promises of Blockchain technology is its use as a political tool for voting, by giving more access to voters to each raised issue, rather than these issues being centralised and therefore not truly reflective for each area of state. And these votes could very likely be fully transparent and accountable via the method\\\\\\\\\\\\\\\\xe2\\\\\\\\\\\\\\\\x80\\\\\\\\\\\\\\\\x99s own Blockchain, visible for all. This Bill marks the beginning of a power shift away from central government to the people, families and communities of Britain. 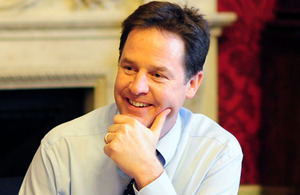 ~\\\\\\\\\\\\\\\\xc2\\\\\\\\\\\\\\\\xa0Nick Clegg. Could a decentralised United Kingdom manage its various areas more conveniently and fairly with a virtual democratic voting process that was more inclusive than anything before? Potentially.Scotland has opened the cracks in the power of control in Westminster; whether anything will come from this, we have yet to see.